Freeride snowboarding in many ways embodies the essence of the sport. It is about going out on the mountain and just enjoying the whole experience. Finding pleasure in exploring the mountain, ripping up smooth groomed runs, bumps, trees, powder or rolling open terrain is what freeride snowboarding is all about. Every individual on the hill will find different ways to enjoy free riding through the freedom that is allows the rider to choose his or her experience. Through personal expression in the activity of snowboarding, a rider turns the mountain in to an artistic canvas. Part of what is so free, about freeriding is the riders’ opportunity to be creative and unique with their riding and style. Surveying the terrain the rider has a canvas to work with. While the activity of freeriding includes cruising with no real plan or aggressiveness on mellow groomers, Freeride Snowboarding is the most fun in varying terrain or features, and when the rider takes the reigns of the ride to put some personal flare and style into the ride. Picking a line down the hill that utilizes rolls, rises and falls, to pump, slash and carve it up as they make that mountain their own. Even, if only for a moment. It is that moment that the snowboarder lives for. New snow, fresh groom, fun jump line, even in the halfpipe, freeriding is just an enjoyable state of shred where the rider rides from the heart. Whether that means ripping powder, scaring yourself on the steeps, a bump line, or boosting out of the halfpipe, freeride snowboarding is incredibly fun. Another important piece of the base skills of any good snowboarder, leading & countering turning movements is another opportunity to control line, energy and flare in freeride snowboarding. Practice finishing turns with as little counter rotation as possible so that you have good rotational range in your core to be able to execute a smooth leading motion through the next turn. With a smooth leading motion through the turn, the rider will feel control and the turn will finish easily and more across the fall-line, with a rounder and usually more carved turn, thereby controlling downhill speed. This will also set the rider up for the edge change to the next turn. If a rider is performing a turn where the rider counter rotates through the turn they will have less control of the turn shape and speed, the turn will finish more parallel with the fall-line and the rider will experience lower energy and less g forces in the turn. Involves making turns, carved or skidded where your center of mass is moving over the board from tip towards the tail or vice versa during the execution of a turn. It’s a good idea for a rider to practice these movements as it is another piece of a riders’ fundamental board skills. If the rider initiates the turn with their weight more over the front foot or nose of the board, then shifts body weight towards the back foot or tail of the board, they will feel an acceleration of speed and energy out of the turn. This can be really fun as is increases the overall energy of the turn and sets the rider up for the un-weight at the edge to edge transition into the next turn. As the rider initiates the next turn, they will shift back toward the nose of the board, to repeat the motion and rock from tip towards tail on the next turn. Find rhythm and repeat. Conversely, if the rider initiates the turn and then shifts towards the nose during the turn the rider will feel a deceleration and lose of energy during that turn. Also, it will put the rider in a somewhat unnatural position to initiate the next turn. This can be useful when trying to get control of speed and slowdown, like when rotating the board under the rider into a slid stopping motion. This one can be a little confusing. The most important thing to remember is the bathroom scale effect. Many people think that bending your knees is adding pressure to the edge or the board, where the reality is the opposite. Imagine standing on your bathroom scale. If you’re standing upright, then in a smooth motion bend your knees and move your hips toward the scale, in that moment that you are actively bending your knees the scale reads a lower weight. If your motionless in a squat, the scale reads your correct weight, then in a smooth motion you stand up, during the active movement the scale reads a higher weight. With that in mind, think about how if you wanted to push off or generate speed and energy through a turn, you would need to start the turn in a squatted or crouched position to allow the range to push with the knees and hips and extend through the turn. Thankfully to properly un-weight and change edges smoothly, a flexion move to finish the turn before will usually set you up to be able to push off or pump through the turn, then finishing that turn with a flexion movement, or bending the knees to un-weight and set up the following turn. Find rhythm and repeat. 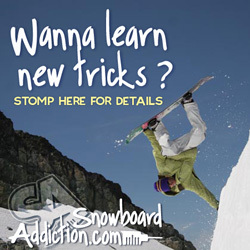 Your freeride snowboarding skills are growing. Now, to see what it feels like, practice making some turn doing the opposite movement we were just working on. This time start the turn real tall in your stance and while you’re making the turn flex down toward your board through your knees and hips. Dang, that feels weird right. You’re effectively trying to make that turn while taking your weight off the board. Not what you want. However, again there is a time and a place to use this. If you’re trying to slow down or absorb a bump, roller or to stop this can help. The finish of this type of turn movement is a low body position, high pressure to the edge and good control of edge angle, so it lends itself perfectly to skidding to a stop. Aggressive Freeride Snowboarding Line Control. Including all three of the above movement groups, the free-ride snowboarding range of movement is incredibly variable and dynamic. Imagine a 3 dimensional range of movement. That includes forward and backward movements, flexed and extended movements, along with leading and/or countering movement in turns to the left or to the right. Take a run through varying terrain, focused on controlling speed through the energy absorbing movements above. Flexing through turns, counter rotating through turns, shifting from tail towards the nose, etc. It will feel really strange and probably not good. This time I want you to take another run, but this time do as little movement as possible. No pumping or absorbing, no dramatic leading or counter rotating, and no fore or aft movements. This time you may feel better in terms of control and flow down the hill. This is a smooth lower energy consuming way to ride and is an option for late in the day when your getting tired and just need to get down.